Jason sent me the amazing story about one of the most awesome original Hip Hop break albums and tracks to ever be sampled. Try to guess...here's a clue: Flashdance. Lino. Frosty Freeze, Rock Steady Crew. Boombox. Got it? Come on, 'Apache', Incredible Bongo Band! (Well, I think it was West Street Mob's version of the tune called 'Break Dancin' (Electric Boogie)'). Wanna hear it? The original is here people...wait till the middle of the MP3! Owww! It's a story of a Bronx D.J. making his name with a record that began as the soundtrack for a B-movie called ''The Thing With Two Heads.'' And it suggests that the two most important drummers in rap history might be a guy who spent his career touring behind Neil Diamond and another who played with John Lennon and Eric Clapton before stabbing his mother to death and being committed to a mental hospital. 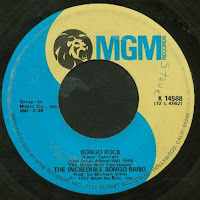 The record in question is ''Bongo Rock,'' a 1972 LP by the Incredible Bongo Band, which, after years of bootlegging, is being properly reissued by the Mr. Bongo label on Tuesday, paired on a single disc with its 1974 follow-up, ''The Return of the Incredible Bongo Band.'' Created by a group of Hollywood session musicians who never toured, it's a set of sometimes thrilling, sometimes cheesy instrumentals built on tight brass charts, psychedelic guitar riffs, funky keyboard vamps and heavy percussion. ''Bongo Rock'' is significant, however, for being one of the musical cornerstones of rap. While it's hard to measure these things accurately, it is certainly one of the most sampled LP's in history, if not the most sampled. Most every history-minded hip-hop D.J. has a copy, and the first few bars of its signature number, a driving cover version of the 60's instrumental number ''Apache,'' can send crowds into overdrive. The story of ''Bongo Rock,'' however, begins far from hip-hop's birthplace in New York, with Michael Viner, a white kid from Washington who worked for Senator Robert F. Kennedy in Los Angeles. After Kennedy's assassination in 1968, Mr. Viner, then 24, roomed with his friend Rosie Grier, the football player turned actor, and returned to the film industry, where he had worked as a youngster. He rose through the ranks and was soon in charge of music for MGM. Mr. Viner, who is 62 and runs Phoenix Books, a successful publisher and audio-book label that counts Bill Maher and the Kiss singer Gene Simmons among its clients, is soft spoken as Hollywood moguls go. But he's a savvy businessman. Forthcoming, too. And so it was when he assembled a group to score a chase scene for ''The Thing With Two Heads,'' a ludicrous but racially provocative horror film starring his pal Mr. Grier and Ray Milland as, respectively, a black head and a white head attached to a single body. The resulting two tracks, ''Bongo Rock'' and ''Bongolia,'' appeared on the soundtrack LP and, later, on a seven-inch single, which became a surprise hit. Flush with some success, the group reconvened to make a full-length LP. And befitting its name, the core of the band was two powerhouse percussionists. One, the bongo and conga player King Errisson, was a revered session man from the Bahamas who played limbo shows in a Miami strip joint before jumping into New York's early-60's jazz scene, where he befriended musicians like Miles Davis and Cannonball Adderley. Mr. Errisson eventually found his groove in California, where, among other gigs, he was Motown's go-to guy for percussion in the late 60's and early 70's, after the label relocated from Detroit to Los Angeles. He played on sessions by the Temptations, the Four Tops, the Jackson Five and the Supremes. The drummer was Jim Gordon, a handsome California boy probably best remembered as part of the group Derek and the Dominoes. During that stint he came up with the famous piano coda for the hit ''Layla,'' written with his bandmate Eric Clapton. His fat, precise beats also turn up on recordings by John Lennon (the ''Imagine'' album), George Harrison, Traffic, Frank Zappa, Steely Dan, Merle Haggard and the Monkees. 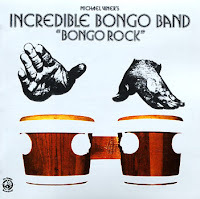 ''Bongo Rock,'' credited to Michael Viner's Incredible Bongo Band, was released in 1972 and did not set the world on fire. ''It bombed,'' said Mr. Botkin, who could barely recall the details of the recording. ''It was just another session. It didn't mean anything.'' The band soon regrouped for a follow-up LP, ''The Return of the Incredible Bongo Band,'' which fared even worse. And that, for all anyone involved could guess, was the end of it. Mr. Viner and Mr. Botkin turned their attention to other projects. Mr. Errisson began his tenure with Neil Diamond's band, which continues. Mr. Gordon, for his part, had dived headlong into the rock scene. After years of living the high life and maintaining his reputation as a consummately reliable player, he became a famous drug casualty. He stopped playing altogether and later claimed he was haunted by imaginary voices. After a series of violent episodes and self-elected stays in psychiatric hospitals, he murdered his mother -- whom he identified as one of the voices in his head -- with a knife in 1983. Meanwhile, back in late 1972 in the Bronx, a young Jamaican immigrant who worked as a D.J at parties under the name Kool Herc discovered the ''Bongo Rock'' LP through his colleague, DJ Timmy Tim. He had heard the ''Bongo Rock'' single, which he thought was O.K. But ''Apache'' was something else. Beginning with the tandem drumming of Mr. Errisson and Mr. Gordon, the song peaks like a fireworks display, with bursts of organ, horns and surf guitar exploding amid a rain of bongo and kit-drum beats. It drove dancers crazy at the Hevalo, on Jerome Avenuebetween Tremont and Burnside, where Herc had a steady gig and where he first played the record for a crowd. Soon, the Merry-Go-Round evolved, as Herc acquired extra copies of certain records, which allowed him to extend percussion-driven sections of songs indefinitely through hand manipulation of the turntables, creating hypnotic percussive loops. The ''Bongo Rock'' LP -- specifically ''Apache,'' but other tracks, too -- was the first record he used in this way. Others followed suit, using breakbeats (as the percussion samples became known) to undergird the chants and rhymes and exclamations of M.C.'s. Rap was born. The ''Bongo Rock'' LP never fell far from favor as a hip-hop building block, from the Sugarhill Gang's 1981 rap version of ''Apache'' to tracks by LL Cool J, Moby, Nas and countless other artists. The lure of ''Apache'' has obsessed fans as well. Last year Michaelangelo Matos, a music writer, compiled a history of the song, tracing its evolution from the British guitarist Bert Weedon's mellow 1960 version through more uptempo versions by the Shadows, the Danish guitarist Jorgen Ingmann (who had a No. 1 hit with it in the United States) and the Ventures, up to modern-day sampled versions. A fellow music historian and blogger, Oliver Wang, picked up on Mr. Matos's paper (first presented at the annual Experience Music Project Pop Conference in Seattle) and posted a clutch of ''Apache'' MP3's on his music blog Soul Sides (soulsides.blogspot.com). Eventually the creators of ''Bongo Rock'' became aware of their music's rebirth. The original Bongo Band recordings had been contractually slated to revert to Mr. Viner from MGM after eight years. But the company had been sold and bought and sold again, so Mr. Viner had to do some detective work to claim ownership, which he secured in 1990. Attempting to track down the countless bootleggers, let along getting paid for what some guess are thousands of sample usages, was another matter. Perhaps the most notable is Nas, who has used Incredible Bongo Band samples on ''Made Ya Look'' and ''Thieves Theme'' (the latter using the band's cover of Iron Butterfly's ''In-A-Gadda-Da-Vida''), among other songs. ''Those breaks are so hip-hop,'' he said in an e-mail message via his label, Def Jam. ''I'm going to continue using them again and again.'' Mr. Viner said he was pleased that Nas has a new record due later this year that reportedly does just that. And never one to miss a business opportunity, Mr. Viner has reconvened a new version of the Incredible Bongo Band, which is finishing work on a record he plans to shop to labels. There are also plans for the group's first public performances, maybe even a tour. The lineup isn't the same: not only is Gordon absent, but Perry Botkin has retired from for-hire arranging in favor of making experimental electronic music at home. But there's talk of Kool Herc being involved. And Mr. Errisson, who put the bongos in the original recordings, is back at the forefront (Neil Diamond is taking a year off, so he has time on his hands). This time, though, he's a bit savvier about the business end of things. ''Back then, I was so busy and so biggity, I didn't pay attention to the one percent he offered me,'' Mr. Errisson said with a laugh, referring to Mr. Viner's offer of royalties on the original recordings. ''I said, 'Just pay me,' you know? I got what I asked for. But now the thing turned out to be a smash. There you go -- those things happen.'' His deal with Mr. Viner for the coming record, he said, is more favorable: a 50-50 split.